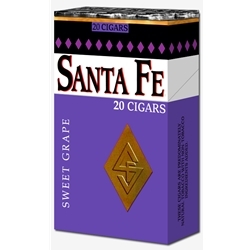 Santa Fe Grape Filtered Cigars are available in Box 100's and packaged 20 cigars per pack, 10 packs to a carton for a total of 200 premium filtered cigars. If you are a fan of Swisher Sweet and their products then you will love Santa Fe Filtered Little Cigars. These little cigars from Swisher International are ideal for short breaks, little in size, big on flavor! Enjoy these deliciously smooth premium filtered cigars and make your breaks more relaxing and enjoyable. Call the customer service line at our online cigar store today and pick up any style flavor of the Santa Fe filtered cigars. We know you’ll enjoy each and every one of them!